Greeting folks Tony from Hurricane wind power here. Let me start out by saying we have put a lot of work into our new wind turbine. We are proud of what he have accomplished and are looking forward to many happy customers. Why should we buy from Hurricane? Before you purchase a bargain cut rate wind turbine that is heavy on promises and minimal in substance educate yourself on the facts. Why should I buy a wind turbine that is rated at half of a cheaper product? 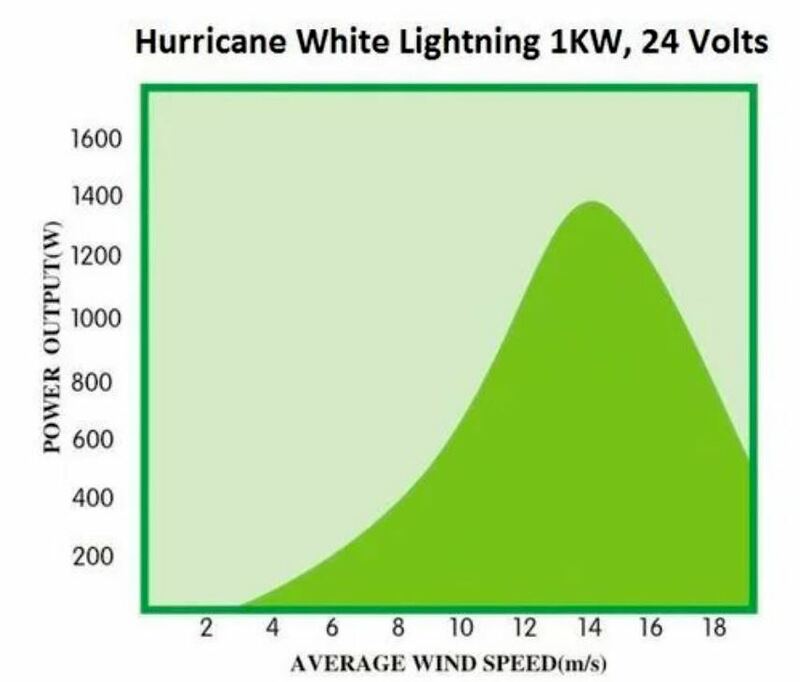 The answer is simple the 1000 watt rating we have posted on the Vector wind Turbine from Hurricane Wind Power is based on the NATIONAL RESEARCH ENERGY LABORATORY standard of 24.6 mph or 11 meters per second wind speed. This turbine and generator is built with a generator and blade set that has a CE standard has been wind tunnel tested and approved by 3rd party engineers. In final analysis you get what you pay for. This turbine has many features and power production that surpasses and in many cases doubles and triples that of competitors that rate turbines to produce 2 KW and more! At the end of the day if you look at the blade diameter a wind turbine can only produce the power that is available in the wind at a given wind speed. If the blade diameter does not have enough diameter to produce the power at a given wind speed the the fact is you can be assured the advertising is false. Heavy steel zinc rich powder coated frame for superior corrosion production and years of lasting beauty. I have my 24 volt vector turbine up and running now for over a month and I am very pleased with its voltage output. At 20 mph wind speed with a slight load it was producing 30 volts so I put a heavy load to keep it around 27. So I can run my equipment and still keep up on electrical input versus consumption. Click the button below to add the Home DIY Wind Generator Kit Hurricane Vector 2.0 Wind Turbine 1000 Watt 24 Volt to your wish list.